PRODUCT DESCRIPTION: Low odor aerosol which can be applied to cracks and crevices, drain pipes and other spaces where target pests like to nest or hide. 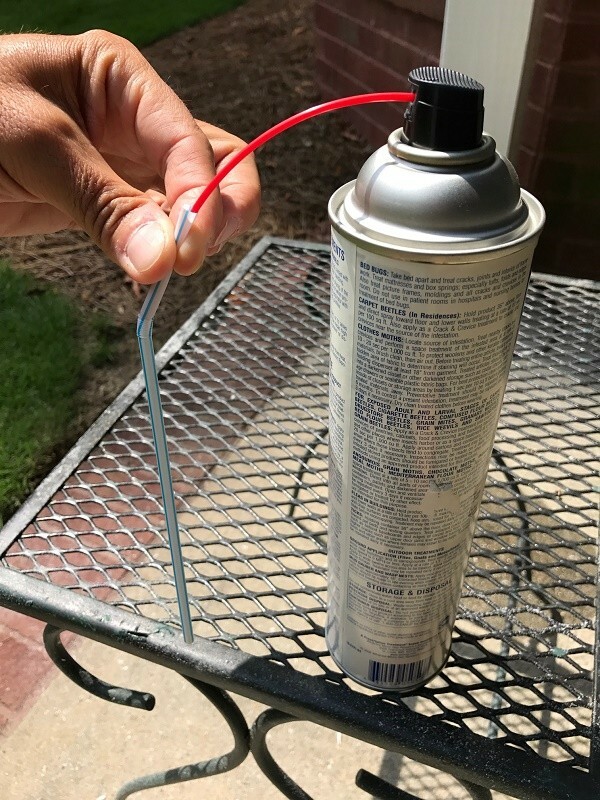 With it's special tip for precise application, you are able to direct the spray into moldings, seams, cracks, crevices, voids and just about any place they might be hiding. TARGET PESTS: Ants, Booklice, Boxelder Bugs, Carpenter Ants, Carpenter Bees, Centipedes, Chocolate Moths, Clover Mites, Cluster Flies, Cockroaches, Crickets, Dermestids, Drugstore Beetles, Earwigs, Elm Leaf Beetles, Flour Beetles, Grain Weevils, Millipedes, Scorpions, Silverfish, Sowbugs, Spiders, Springtails, Termites*, Ticks, Trogoderma (Cabinet, Khapra and Warehouse Beetles), Wood Infesting Borers and Beetles and Wood Wasps. WHERE TO USE IT: Kitchens, bathrooms, closets, living rooms, bedrooms and other locations around the home. 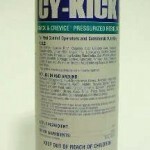 Cykick has no odor and dries quickly. When using down the drain, it may be hard to get product to come out if you tilt the can too much to one side. For large sinks, this should not be an issue. But for small sinks, try using it without the crack and crevice tool or use a drinking straw to "extend" the included straw. The picture to the left shows how to hold a drinking straw in place to make the application straight down. RATE OF APPLICATION: One can is enough to treat 2-3 rooms real well. Since you are mostly applying it to cracks and crevices it should cover large areas. AVAILABLE IN OIL BASE. MORE PENETRATING BUT MESSIER. NOT LABELED FOR DOWN DRAINS. Terrific. Well, this product appears to be working well. Seeing less and less of these small black bugs. I had salvaged several nice pieces of wood for crafts. I went to check the dryness and found little piles of sawdust all around the wood as well as many holes in the wood. I'm thankful for the research available on this site. I was able to determine the correct pesticide to protect my future wood salvaged. Thank you. Springtail Relief! I've been fighting a Springtail infestation in my home for the past several months. I have a Pest Control company come and spray the house inside & out 6x/yr and they came in and dumped "stuff" down the drain and sprayed for Springtails but nothing offered any relief. I bought Phantom, Cykick, and Drain Pipe Treatment, used them all 3 exactly how the website indicated and I noticed an immediate improvement. With continued use, I no longer have an issue in 2-3 of my bathrooms. And I envision the Springtails in my remaining bathroom will be eradicated with a little more time. I am really impressed with these products and will continue using them. Worked Great! We bought this product to control twig bores on our Black Locust tree and it worked like a charm! I'm having a hard time getting the aerosol to spray sideways. My sink is narrow and square and if I turn the can upside down, nothing comes out. When I lay it sideways, it kind a comes out but not as well as when its upright. Is there some kind of extension I can use to direct the spray down the sink? The springtails are coming out faster than I can spray them dead! !